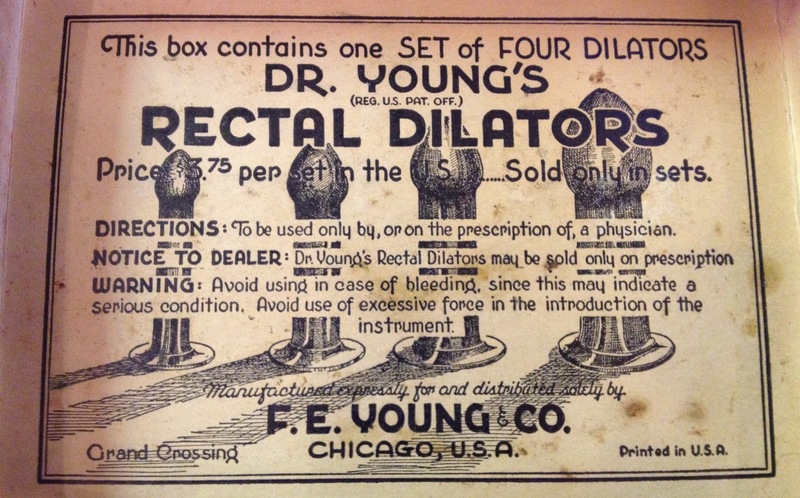 Dr. Young's Ideal Rectal Dilators Were a Real Thing! 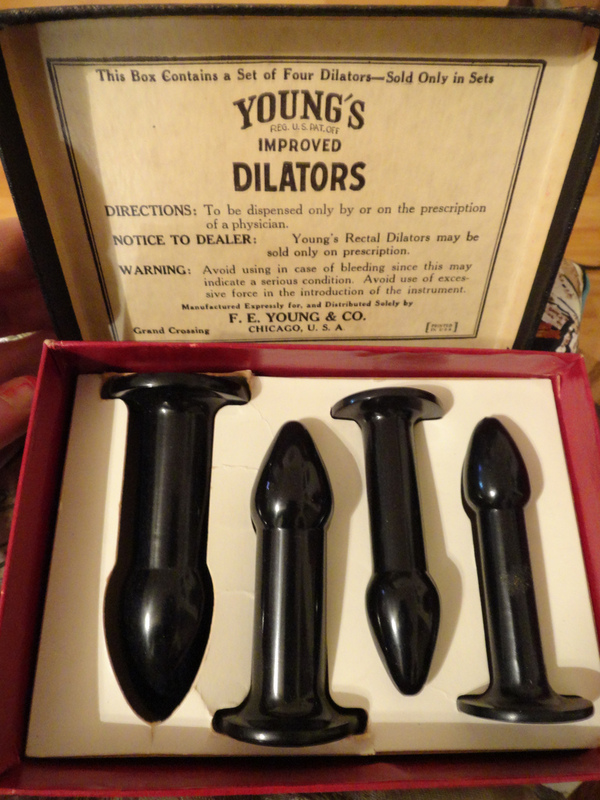 Dr. Young’s Dilators were a real medical device sold in the United States from the late nineteenth century until at least the 1940s. They were a set of four “torpedolike” hard-rubber (later, plastic) instruments varying in diameter from ​1⁄2 to 1 inch and in length from 3 to 4 inches. 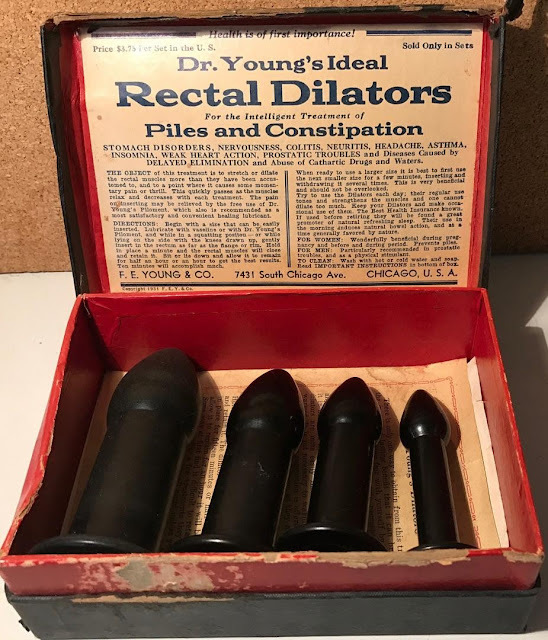 Dr. Young himself praised rectal dilation as a cure for insanity, claiming that at least “three-fourths of all the howling maniacs of the world” were curable “in a few weeks’ time by the application of orificial methods”. Young also admitted that some patients panicked at the sight of the devices. 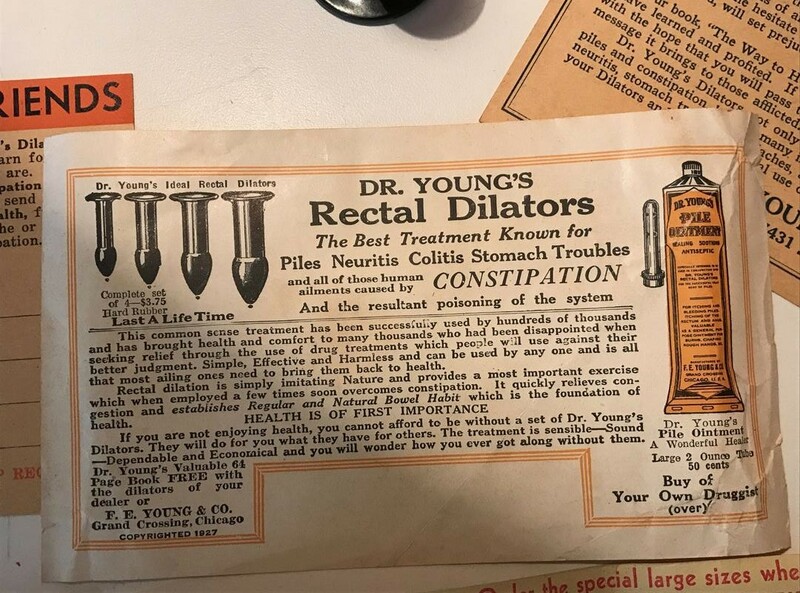 The product claimed it corrected constipation, promoted more refreshing sleep, and could relieve foul breath, bad taste in the mouth, sallow skin, acne, anemia, lassitude, mental hebetude, insomnia, anorexia, headaches, diarrhea, hemorrhoids, flatulence, indigestion, nervousness, irritability, cold extremities, and numerous other ailments. 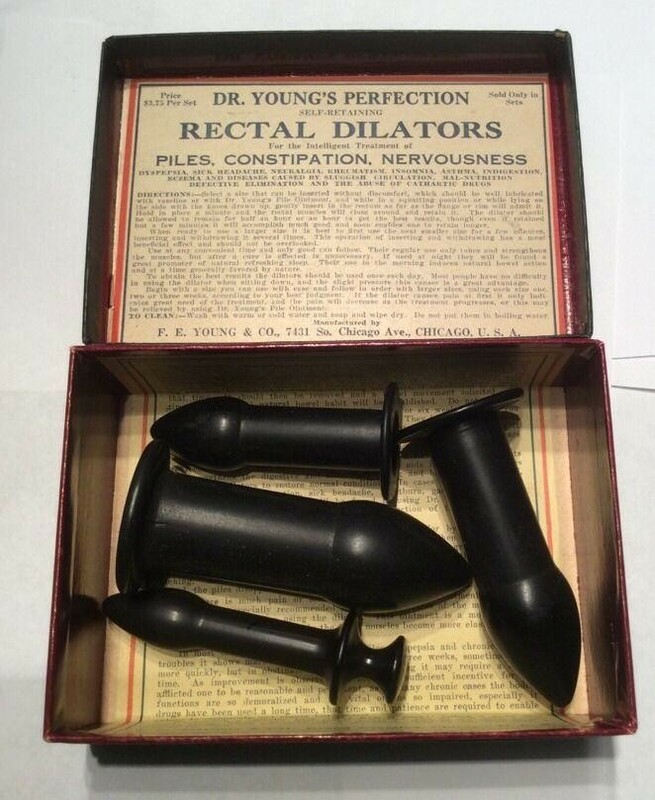 The instructions warned, “Do not neglect to use your Dilators ... 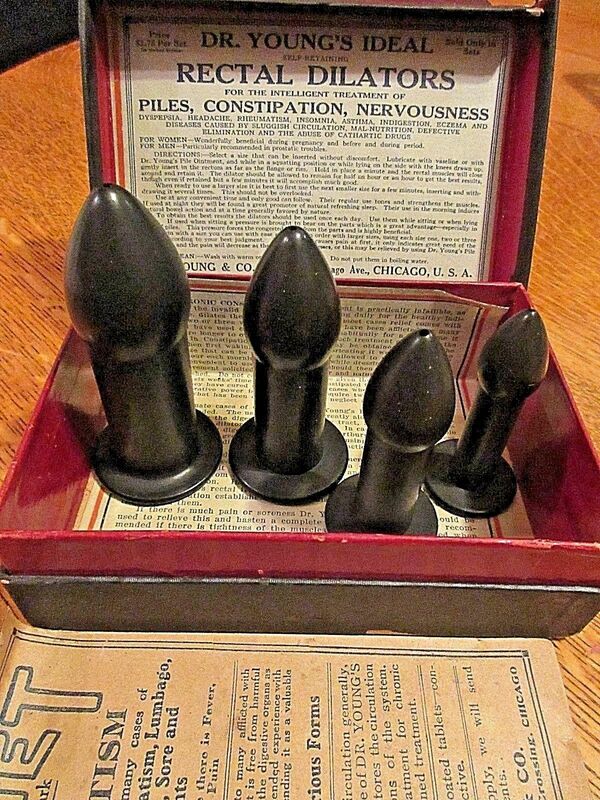 It is advisable to use [them] occasionally as a precautionary measure. 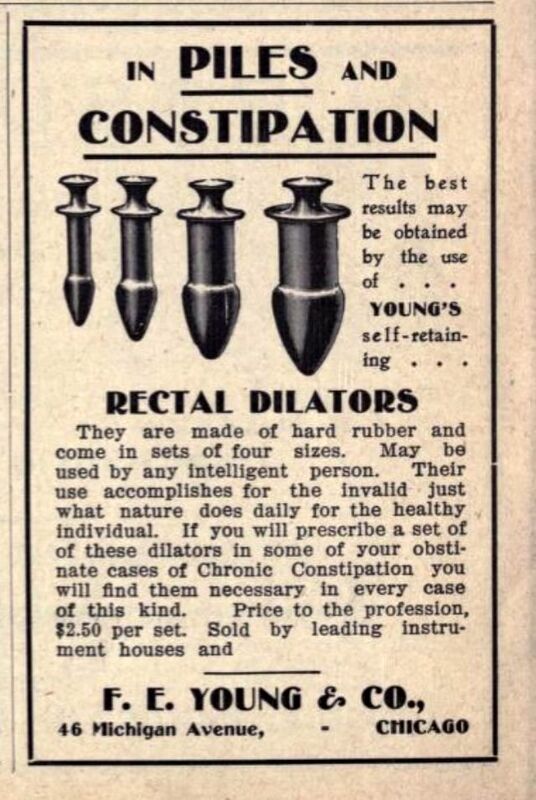 You need have no fear of using them too much”. A 1905 advertisement by F. E. Young and Co. of Chicago promised that “The best results may be obtained by the use of Young’s self-retaining rectal dilators”, the use of which “accomplishes for the invalid just what nature does daily for the healthy individual”. 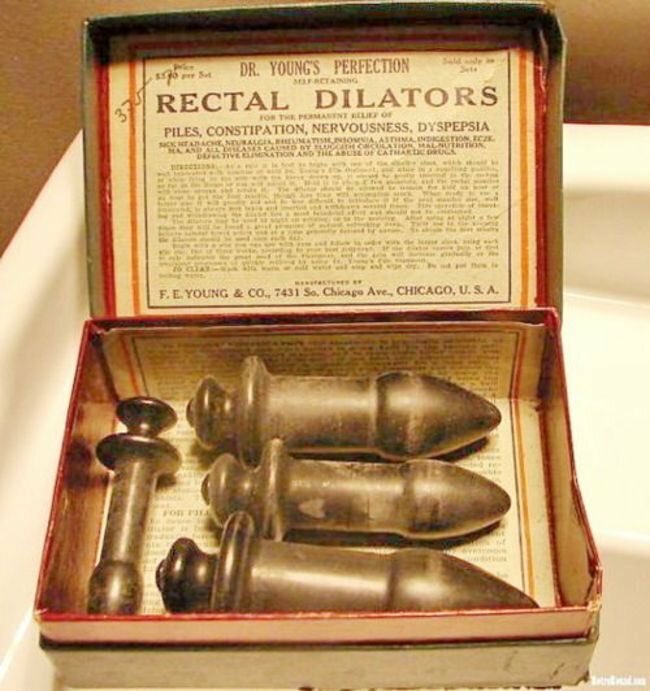 Doctors were advised that “If you will prescribe a set of these dilators in some of your obstinate cases of Chronic Constipation you will find them necessary in every case of this kind”. 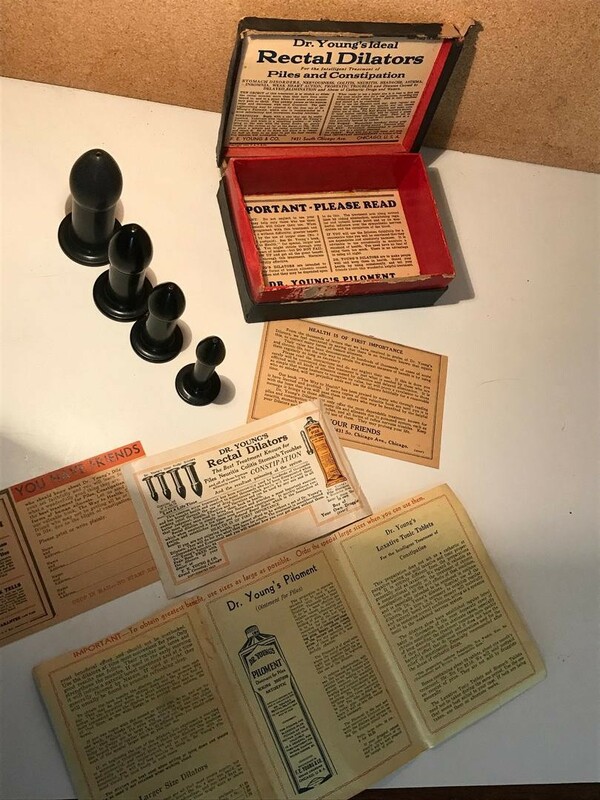 The price of a set “to the profession” was $2.50 (equivalent to $70 in 2018). An advertisement by F. E. Young and Co. of Chicago on Detroit Medical Journal, August 1905. 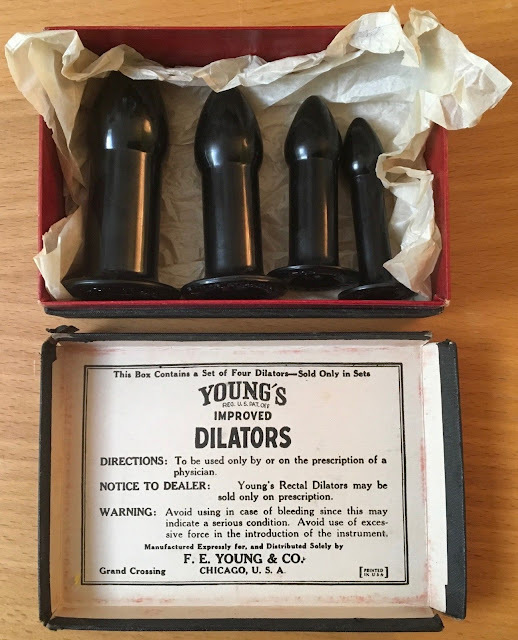 It wasn’t until 1938 that the new US Federal Food, Drugs and Cosmetics Act encompassed the sale of medical devices, and once that was in force it didn’t take long for the dilators to attract the courts’ attention. In 1940, a shipment of dilators and their lubricant, Piloment, was seized at New York and the US Attorney for the Southern District of NY filed libels against them, alleging that they were misbranded. The hearing accepted that “it would be dangerous to health when used with the frequency and duration prescribed, recommended, or suggested in the following labeling,” and the consignment was condemned and destroyed – one of many examples of a potentially useful product falling foul of claims beyond what it could really achieve.